The Alhambra Portfolio brings all the talents of the research team to bear. We have spent years investigating potential tactical approaches to investing. The vast majority of the methodologies we investigated added little or no value for the typical investor. Many of them were just statistical anomalies that we felt would not repeat. Some could only be executed with very large portfolio sizes and/or required flawless execution. We believe the greatest service we’ve rendered to our clients and prospective clients is this elimination of strategies that do not work. Having eliminated most tactical approaches, we are left with a few that consistently add value. There are really only a few things that work and we think we’ve narrowed it down to the few that will continue to do so. Ultimately our methods boil down to two things – momentum and value. We added some of these elements in the Citadel portfolio. In the Alhambra Portfolio, we add two final pieces to solve our enigmatic investing puzzle. The Alhambra Portfolio builds on the Citadel Portfolio by adding a momentum factor to the strategic allocation and/or by using carefully selected individual securities in lieu of ETFs to achieve alpha. 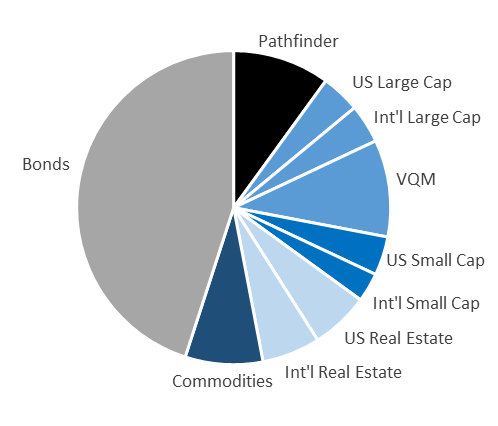 In the Citadel Portfolio, momentum is used within each asset class. For instance, we monitor momentum between international and domestic stocks within the Large Cap allocation. We also monitor momentum between value and growth indices. In the Alhambra Portfolio, we apply the momentum strategy across asset classes by adding the Pathfinder Portfolio to the allocation. 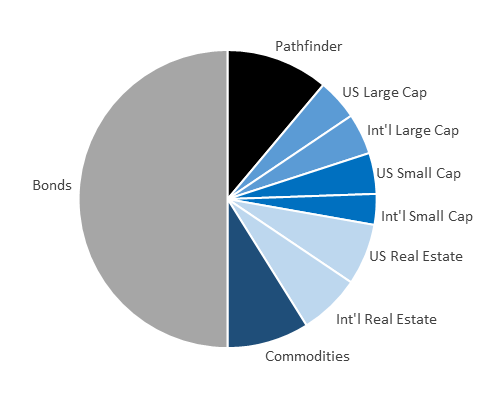 The Pathfinder Portfolio captures the changes in momentum that occur between asset classes. The portfolio emphasizes near-term performance but also captures longer-term changes that occur across the business cycle. Markets anticipate and influence changes in the economy. Pathfinder captures this effect and adjusts the strategic allocation as we move through the business cycle.  The Alhambra Portfolio can also incorporate individual securities and actively managed funds into the allocation. We shift some of the stock portion of the portfolio to our Archer Portfolios. While each model relies on the VQM ranking system, the Dividend Growth and Earnings Revision models emphasize those characteristics. The Alhambra Portfolio may also include individual securities and actively managed funds in other asset classes. If you’d like some more information on the Alhambra Portfolio, or if you’d like to receive a complimentary portfolio review, please contact us at info@alhambrapartners.com or call us at 305-233-3772. Before we invest the first penny for you, we need to know about you. We need to find out what’s important to you, what your dreams and goals are and the type of investing that will give you peace of mind.